ROME.- "God is good to me, he has bestowed on me a healthy dose of unawareness. I just do what I have to do. From the start I said to myself, Jorge, don´t change, just keep on being yourself, because to change at your age would be to make a fool of yourself". He did not dodge any sensitive issue, such as the controversies of the extraordinary Synod of Bishops on the family which took place last October. 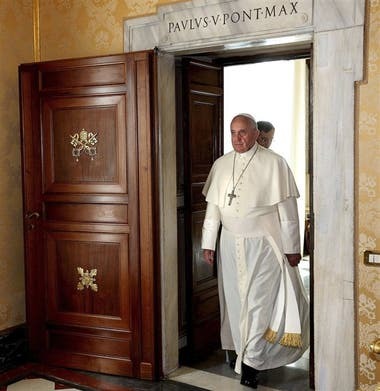 This General Assembly allowed in-house divisions to surface differences in opinion about how to face certain challenges, such as the issue of catholics who have divorced and remarried, who the Pope defined as "excommunicated in fact". "The German Cardinal Walter Kasper said we should look for hypothesis, that is, he paved the way. And some people got frightened", he explained. "When I heard Misa Criolla for the first time I was a student, I think I was studying theology at that time, I can´t remember well. i really liked it! I enjoyed ´Lamb of God, which is magnificent. I will never forget that I heard Mercedes Sosa singing it", the Pope admitted. What stands out as the best moment and what as the worst? and this is the absolute truth, this is something I actually want to say. Before I came over here I was in the process of retiring. That is to say, I had agreed with the nuncio that when I got back to Buenos Aires we would be putting together a short list of three candidates so that by last year end the new archbishop might take over. That is to say, my mind was focused on the confessionals of the churches where I would be hearing confession. I even had the project of spending two or three days in Luján and the rest of my time in Buenos Aires, because Luján means so much to me and the confessions there are a grace. When I came here I had to start all over again, all this was new. From the start I said to myself: "Jorge, don´t change, just keep on being yourself, because to change at your age would be to make a fool of yourself". That´s why I´ve always kept on doing what I used to do in Buenos Aires. Perhaps even making my old mistakes. But I prefer it like this, to be myself. That evidently caused some changes in the protocols, not in the official protocols because I´m very careful about abiding by them. The thing is that I am who I am even where protocols are concerned, just as I was myself in Buenos Aires. You can see why "not changing" suited me so well. This article was translated by Vivien Pérez Moran.